Teesid: Käesolev artikkel käsitleb uusklassikalist luulet ehk luulet, mis tärkab humanistliku hariduse pinnalt ja on loodud nn klassikalistes keeltes ehk vanakreeka ja ladina keeles. Artikli esimene pool toob välja paar üldist probleemi varauusaja poeetika käsitlemises nii Eestis kui mujal. Teises osas esitatakse alternatiivina mõned näited (autoriteks G. Krüger, H. Vogelmann, L. Luden, O. Hermelin ja H. Bartholin) Tartu ja Tallinna uusklassikalisest luulest värsstõlkes koos poeetika analüüsidega, avalikkusele tundmata luuletuste puhul esitatakse ka originaaltekstid. This article discusses poetry in classical languages (Humanist Greek and Neo-Latin) belonging to the classical literary tradition while focusing on poetry from Tallinn and Tartu from the sixteenth and seventeenth centuries. It does not aim to present an overview of this tradition in Estonia (already an object of numerous studies), but rather to discuss some general problems connected to such studies—both in Europe and Estonia—and to show some alternative (or complementary) analyses of neo-classical poetics, together with verse translations and texts that are not easily available or are unknown to the scholars. The discussion of neo-classical poetry in Estonia finds problems in a detachment from poetics and the consequent discrepancies. Firstly, although scholarly treatises stress the value of casual poetry (forming the most eminent part of Estonian Neo-Latin and Humanist Greek poetry), the same treatises present this poetry from the viewpoint of its social background, focusing more on the authors and events than the poetic form. 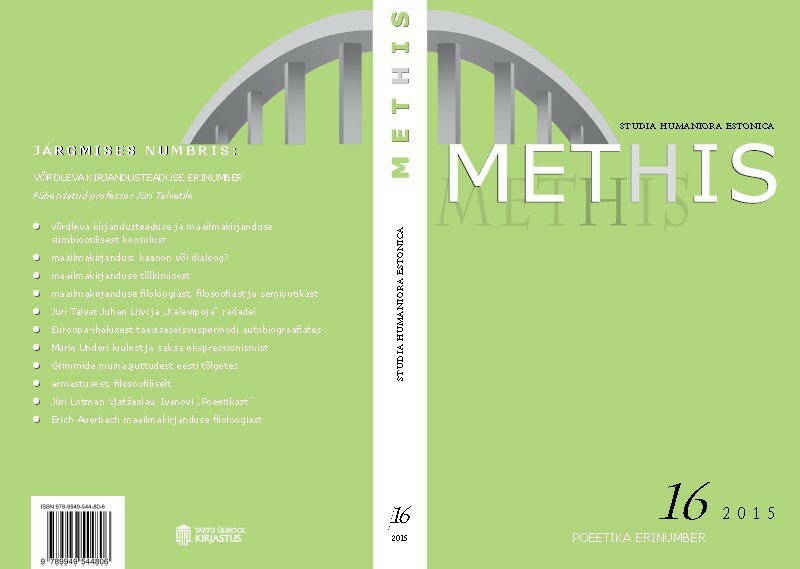 For example, in the Anthology of Tartu casual poetry and the corpus of Neo-Latin poetry from Tartu, texts are presented according to genre, which is defined only according to the classification of social events (epithalamia, epicedia, congratulations for rectorate, disputations, etc). Secondly, in most cases (the anthology, re-editions), this poetry is presented to readers as prose translations. As in the case of ancient Greek and Roman poetry, the established norm in Estonia is verse translation. Translating poetry into prose, therefore, signals that these works are not to be considered poetry. Thirdly, commentaries on this poetry tend to list lexical parallels with authors from classical antiquity without distinguishing actual quotations from the usage of poetic formulae while simultaneously (mostly) ignoring the impact of pagan and Christian texts from late antiquity and renais­sance and humanist literature. One alternative is to present Neo-Latin and Humanist Greek poetry as verse translations and focus more on discussing poetic devices and the impact of its contemporary poetry. Therefore, the second part of this article presents five poems as translations of verse and a subsequent analysis of their poetics. The first example is from a manuscript in the Tallinn City Archives and represents the earliest collection of neo-classical poetry, containing one Latin and five Greek poems belonging to the epistolary poem genre. Its author, Gregor Krüger Mesylanus (a latinized Greek translation of the name of his birth-town Mittenwalde, near Berlin), worked as a priest in Reval after his studies in Wittenberg during the time of Ph. Melanchthon (which explains Krüger‘s chosen poetic form). The Greek cycle is regarded thematically as variations on the same subject of the author‘s longing for home and his unhappiness with the jealousy and hostility of his fellow citizens in Reval. His choice of meter is influenced by Latin poetry, the initial long elegy balanced by four shorter poems of different meters (iambic and choriambic patterns). The final poem of the Greek cycle (Enviless Moon) is presented together with a metrical translation and analysis to demonstrate how sonorous patterns orchest­rate the thematic development of the poem: the author‘s wish to be like the moon, who receives its light from the brighter sun, but remains still happy and grateful to God for his own gift and ability to bring a smaller light to others. The second example analyzes the structure and poetic motives of a metrical translation of a Greek Pindaric Ode by Heinrich Vogelmann from 1633. The paper’s author also examines the European tradition of The second example analyzes the structure and poetic motives of a metrical translation of a Greek Pindaric Ode by Heinrich Vogelmann from 1633. The paper’s author also examines the European tradition of such odes (including more than sixty examples from 1548 until 2004). The third example discusses two alternative translations and additional translation possibilities of a recently discovered anagrammatic poem by Lorenz Luden. The fourth and fifth examples are congratulatory poems addressed to Andreas Borg for the publication of his disputation on civil liberty (in 1697). A Latin congratulatory poem by Olaus Hermelin is an example of politically engaged poetry, which addresses not the student but the subject of his disputation and contemporary political situation (the revolt of Estonian nobility against the Swedish king, who had recaptured donated lands, and the exile of its leader, Johann Reinhold Patkul). The Greek poem by H. Bartholin refers to the arts of Muses to demonstrate the changes in poetical representations of university studies: by the end of the seventeenth century the motives of the dancing and singing, flowery Muses is replaced with the stress of the toil in the stadium and the labyrinth of Muses. The second example analyzes the structure and poetic motives of a metrical translation of a Greek Pindaric Ode by Heinrich Vogelmann from 1633. The paper’s author also examines the European tradition of This article discusses poetry in classical languages (Humanist Greek and Neo-Latin) belonging to the classical literary tradition while focusing on poetry from Tallinn and Tartu from the sixteenth and seventeenth centuries. It does not aim to present an overview of this tradition in Estonia (already an object of numerous studies), but rather to discuss some general problems connected to such studies—both in Europe and Estonia—and to show some alternative (or complementary) analyses of neo-classical poetics, together with verse translations and texts that are not easily available or are unknown to the scholars. The discussion of neo-classical poetry in Estonia finds problems in a detachment from poetics and the consequent discrepancies. Firstly, although scholarly treatises stress the value of casual poetry (forming the most eminent part of Estonian Neo-Latin and Humanist Greek poetry), the same treatises present this poetry from the viewpoint of its social background, focusing more on the authors and events than the poetic form. For example, in the Anthology of Tartu casual poetry and the corpus of Neo-Latin poetry from Tartu, texts are presented according to genre, which is defined only according to the classification of social events (epithalamia, epicedia, congratulations for rectorate, disputations, etc). Secondly, in most cases (the anthology, re-editions), this poetry is presented to readers as prose translations. As in the case of ancient Greek and Roman poetry, the established norm in Estonia is verse translation. Translating poetry into prose, therefore, signals that these works are not to be considered poetry. Thirdly, commentaries on this poetry tend to list lexical parallels with authors from classical antiquity without distinguishing actual quotations from the usage of poetic formulae while simultaneously (mostly) ignoring the impact of pagan and Christian texts from late antiquity and renaissance and humanist literature. The first example is from a manuscript in the Tallinn City Archives and represents the earliest collection of neo-classical poetry, containing one Latin and five Greek poems belonging to the epistolary poem genre. Its author, Gregor Krüger Mesylanus (a latinized Greek translation of the name of his birth-town Mittenwalde, near Berlin), worked as a priest in Reval after his studies in Wittenberg during the time of Ph. Melanchthon (which explains Krüger‘s chosen poetic form). The Greek cycle is regarded thematically as variations on the same subject of the author‘s longing for home and his unhappiness with the jealousy and hostility of his fellow citizens in Reval. His choice of meter is influenced by Latin poetry, the initial long elegy balanced by four shorter poems of different meters (iambic and choriambic patterns). The final poem of the Greek cycle (Enviless Moon) is presented together with a metrical translation and analysis to demonstrate how sonorous patterns orchestrate the thematic development of the poem: the author‘s wish to be like the moon, who receives its light from the brighter sun, but remains still happy and grateful to God for his own gift and ability to bring a smaller light to others. Janika Päll – PhD klassikalises filosoofias. Ta on õpetanud klaverimängu, klassikalisi keeli (eeskätt vana-kreeka keelt ja kirjandust) ning retoorikaajalugu mitmes Eesti õppeasutuses ning töötab hetkel Tartu Ülikooli raamatukogus teadurina. Tema peamised teadushuvid on vanakreeka keel (eeskätt süntaks) ja kirjandus, kreeka ja ladina rütmika, retoorikaajalugu (antiigist varauusajani) ja humanistide kreeka keel. Janika Päll – PhD in classical philology. She has taught piano, classical languages (especially ancient Greek language and literature) and the history of rhetoric in several Estonian educational institutions and is presently working as a researcher at Tartu University Library. Her main scholarly interests are Ancient Greek language (especially syntax), Greek and Latin rhythmic, the history of rhetoric (from antiquity to Early Modern period) and Humanist Greek.